For Field Day 2018 we decided to again go to Rivers Edge RV Park. 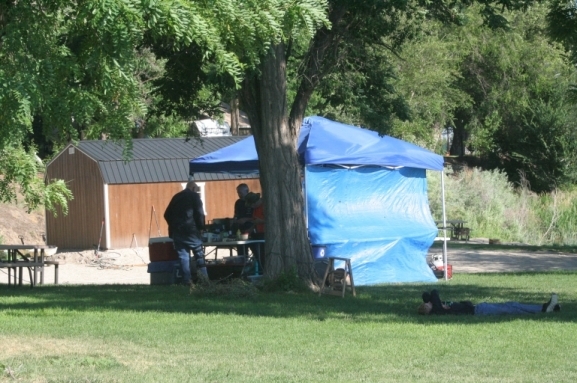 We had a lot of people there to help set up, we used two popups with heavy tarps on the sides to help darken the interior. 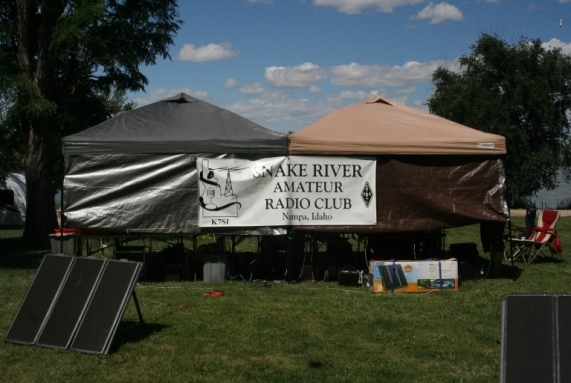 We had 5 radio setups on the air at a time, all working QRP and using batteries with solar panels for power. We used N3FJP's logging program on our laptops and one desktop computer which was our "server" for the program. We made 216 contacts despite the poor band conditions. We had use of four bands - 80, 40, 20, and some of 15. Almost all of the digital contacts were on 40 meters. For some reason we had problems making digital 20 meter contacts. A good time was had by all, with good food Saturday night and Sunday morning. Those of us that stayed Sunday night had a delicious bonus dinner prepared for us. Our setup from the outside. Notice two sets of Solar Panels. There is a third solar panel on the other side of the popup. 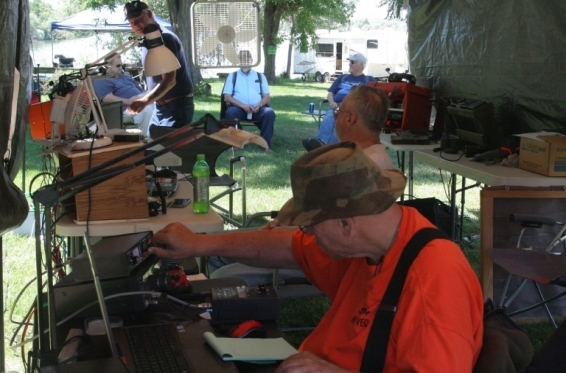 John, NO6Z, Steve, WB7VEQ, andJohn, KD7HGS, working at their stations. Steve, WB7VEQ, tuning his radio and antenna. Standing at the back of the work area is Bob, W7RLS. Saturday was hot and we hung a fan at the entrance to help move air. John, NO6Z, at his station. 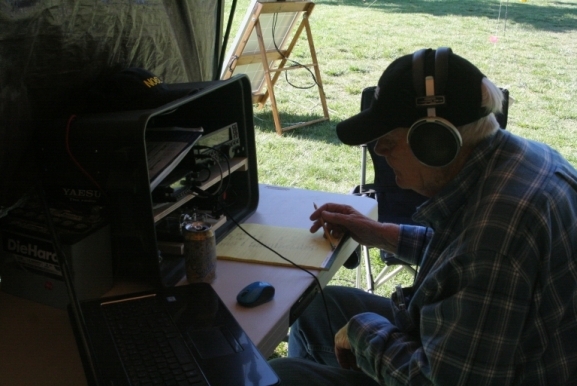 John worked 40 Meter CW, making some good contacts. 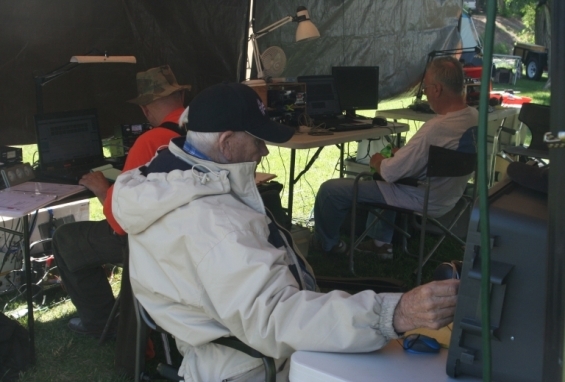 On a side note, John is 85 years old this year, and has been a solid CW operator for over 70 years now! We hope to keep him around a long time. 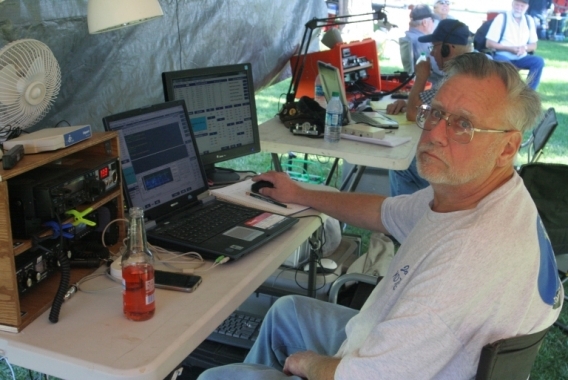 John, KD7HGS, working digital contacts. Notice the second monitor on his table. That is the monitor for the scoring server. This pic was taken late Sunday morning, hence the vacant thousand-yard stare. Eighteen hours in front of a screen will do that for you.